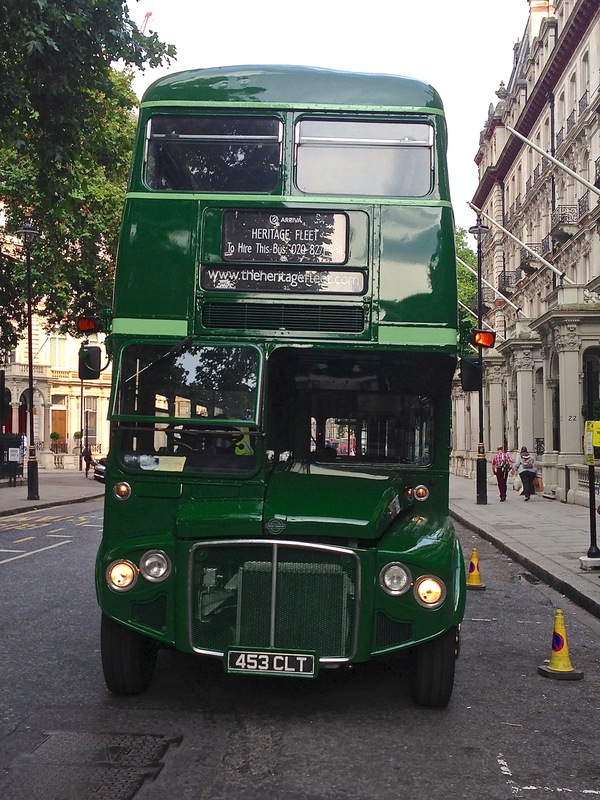 I experienced all things Routemaster recently as – by sheer coincidence – both days of a weekend saw me riding on versions of the famous bus for the first time in years. 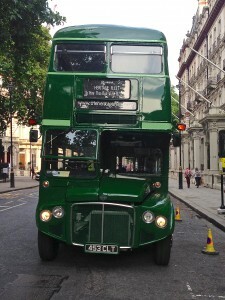 The vehicle was officially withdrawn from London’s streets in 2005 and it now only operates on one route, the number 15, or more accurately the 15H, ‘H’ standing for heritage, running between Tower Hill and Trafalgar Square. Yet there will always be a Routemaster running somewhere and the National Trust London Project, which aims to promote knowledge of London’s architectural history and sites, runs tours on a green-liveried version at various times during the year. 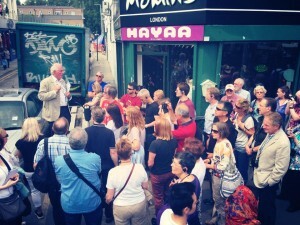 We were lucky enough to get on board for the final summer tour of 2014 with our charming and genial host, the television presenter and architectural historian Dan Cruickshank. A long-time resident of east London it was only right that Dan took us on a tour of the area and we started in Whitechapel Road, directly opposite the place of my birth, The London – now Royal – London Hospital, the magnificent 18th century building currently boarded up for redevelopment. An obligatory visit to the site of Jack the Ripper’s first murder in 1888 in Buck’s Row, now Durward Street, also took in the house in Fulbourne Street where a Bolshevik congress was held at a socialist club in 1907, those present including Lenin, Trotsky and Stalin. Then our RMC 1453 Routemaster, built in 1962 for London Transport’s Green Line country service, took us further east to the House Mill at Bromley-by-Bow, thought to be the largest tidal mill still in existence in the world. 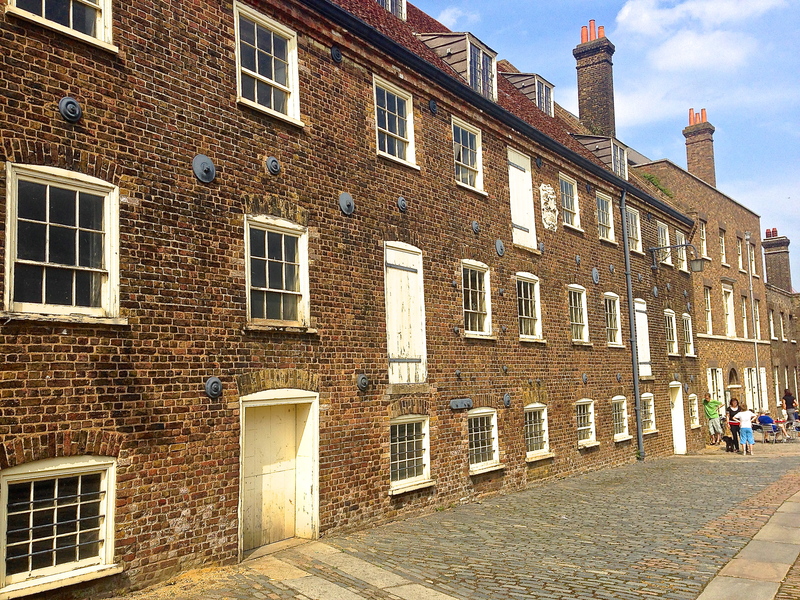 Built in 1776 to mill flour it also served the gin distillery next door on Three Mills Island. As an East Ender by birth, I have to shamefully admit that I knew nothing of this place until a recent mention of it on the London Historians’ website and the visit was an eye-opener. Escorted by resident volunteer guides, we were taken though the various milling processes and the plans for the continuing restoration of the site and its works. The building needs to raise millions more for its maintenance and repair as you can see on the House Mill site itself. 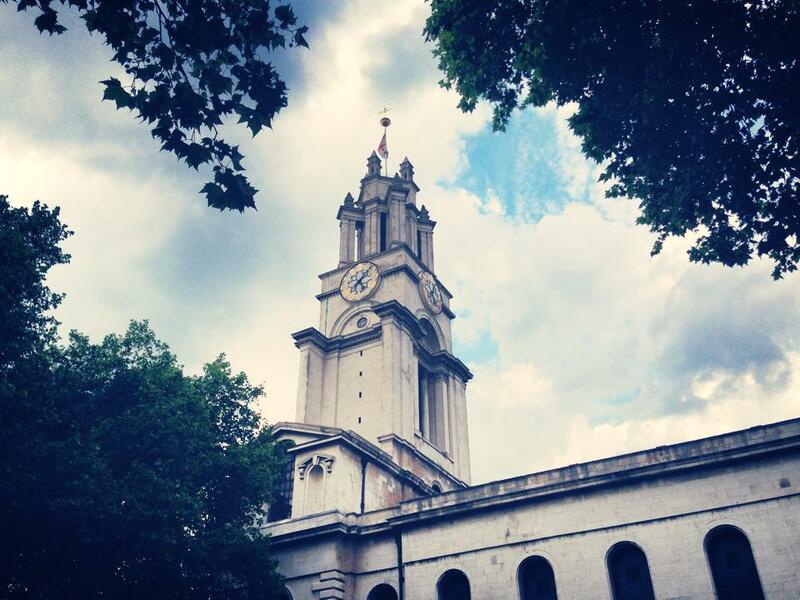 Then we headed westwards to St. Anne’s Church, Limehouse, built between 1714 and 1727 as one of the Commissioner churches on the order of Queen Anne to combat non-Conformism. 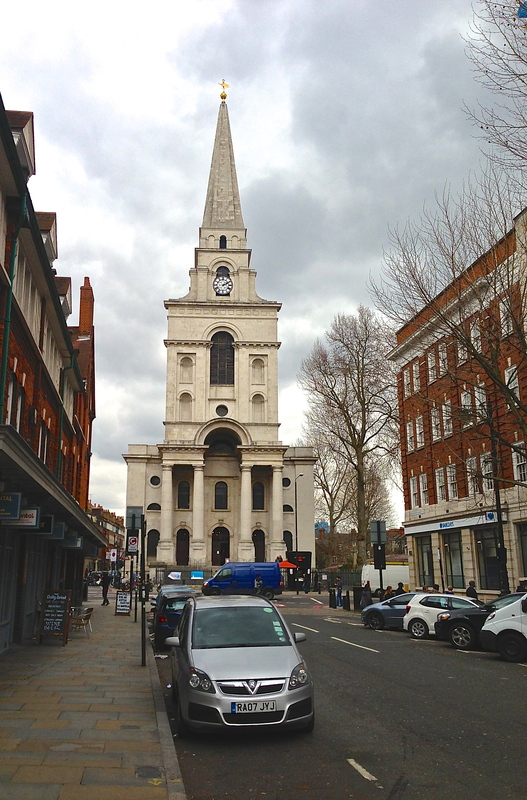 Another Hawksmoor design like Christ Church, Spitalfields, it was consecrated in 1730 and still has an active congregation. St Anne’s has a long-standing connection to the Royal Navy and its current Rector is the service’s honorary Chaplain. Being so near the River Thames, and with many maritime links, Queen Anne permitted the new church to fly the ensign of the second most senior Admiral – the White Ensign – which it still does to this day. 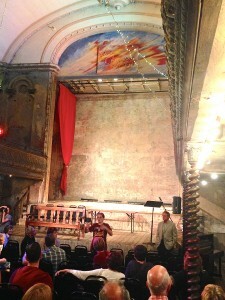 Our tour finished at Wilton’s Music Hall, one of the very few surviving music halls anywhere in the world and opened by John Wilton in 1859. A survivor of the Blitz and the threat of demolition in the slum clearances of the 1960s, it is now undergoing a major refurbishment, while continuing to run as a multi-media arts centre. Dan’s persuasive manner managed to gain us entry to the auditorium, a true wonder of the Victorian age and yet another (shameful) first for this East Ender. Dan was his usual mine of information throughout, reading from the horrific descriptions of the East End by the writer Jack London who was supposedly being sympathetic and generally being the same Dan Cruickshank we see on television, a thoroughly engaging personality. 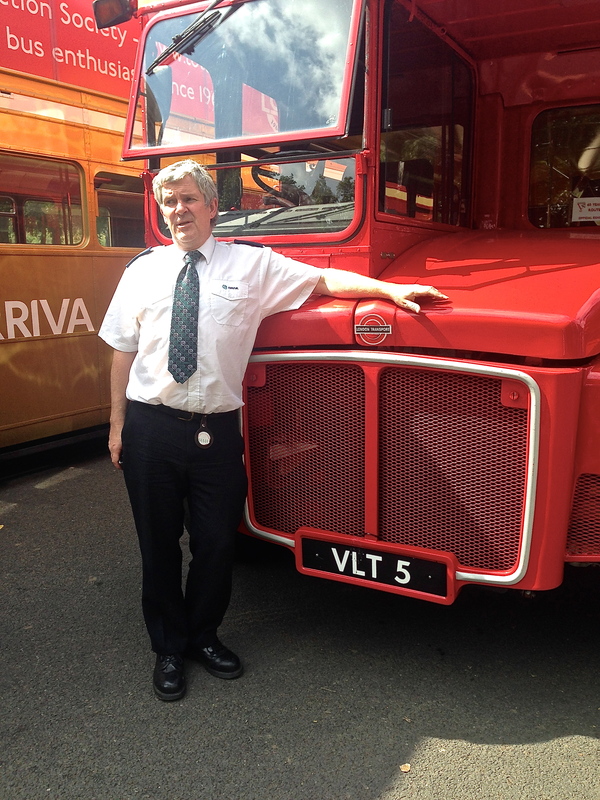 We fetched up back at the National Trust’s London HQ in Victoria after being driven across town by Joe Kerr, a driver of Arriva’s Heritage Fleet of vintage Routemaster buses who I also met the next day to celebrate the bus’s 60th anniversary. Joe was driving RM 5 on this occasion – “built the year I was born” – and I won’t spare his blushes by revealing that was 1959. 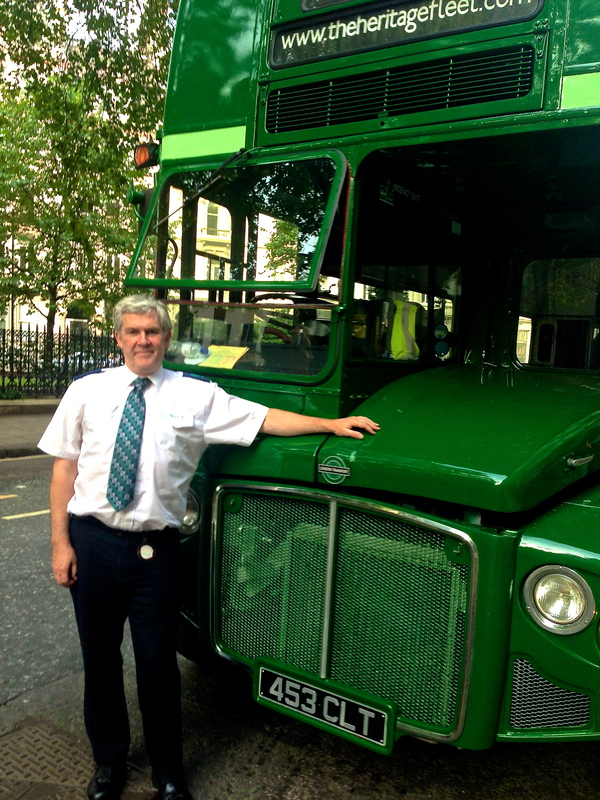 He still drives one day a week for Arriva from the Tottenham bus garage but most of his bus duties now are taken up with the company’s Heritage Fleet. He also has another career as a head of department at the Royal College of Art where he teaches history and theory to students in the Architecture and Vehicle Design programmes. The first Routemaster prototype was built at London Transport’s Chiswick Works in 1954 and introduced to the capital’s roads two years later. A total of 2,876 were built altogether, the last in 1968, and almost half are still in existence. It has been London’s favourite bus for all of those 60 years, made by Londoners for Londoners, and to celebrate its Diamond Anniversary, a gathering of the vehicles was organised by the Routemaster Association in Finsbury Park, north London. In total, 136 attended, more than the previous celebration ten years ago. There was even a converted Routemaster driven from Germany and the site of so many of the vehicles lined up the full length of the park drive was spectacular. 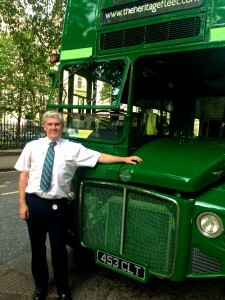 Although Joe says that most people prefer a red-liveried Routemaster when they hire a vehicle from the fleet, I noticed people stopping and staring when he drove the green bus across London on the Saturday. For some it was a glimpse of the past, for others something new, but as the pictures show, it was and remains a fine piece of engineering and an important part of London’s history. The Museum of London will be holding an exhibition about the fictional detective Sherlock Holmes in the autumn of 2014, the first major temporary exhibition about the sleuth since the 1951 Festival of Britain. It will stress his links to the capital and the Victorian/Edwardian environment in which his creator, Sir Arthur Conan Doyle, was writing. The big question is, however, can an author’s creation be classified as an iconic London personality? The museum obviously thinks so and it would be surprising if the show was not a major success, given that Holmes is without doubt the most famous detective in the world, fictional or not. Museums are dedicated to him in London and Switzerland and there are a number of Sherlock Holmes societies around the world. 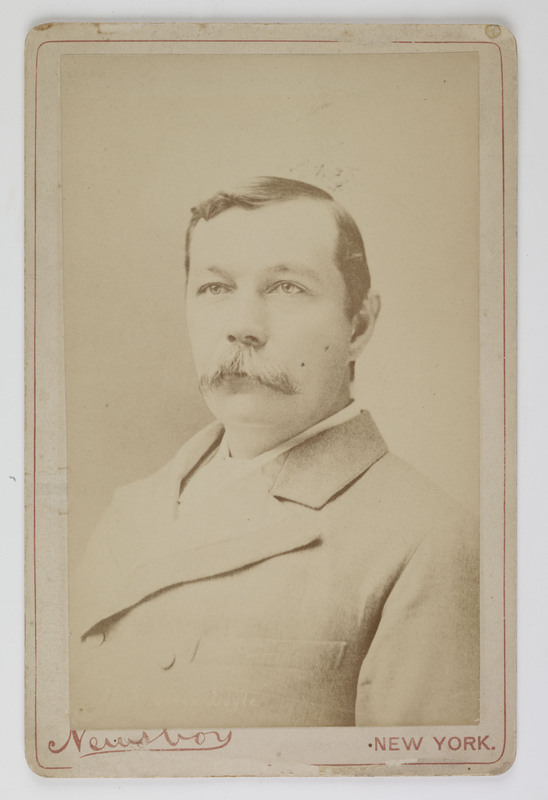 So what were Conan Doyle’s links to London? Very few, as it turns out. Medically trained, he opened an eye clinic in 1891 in Upper Wimpole Street and lived in lodgings in nearby Montague Place. Ill health and a lack of patients forced him to move to Tennison Road, South Norwood (then actually in Surrey) later that same year, and it was here that he wrote many of the Sherlock Holmes stories. He left the London area for good in 1894 to take his ailing wife abroad and when they returned in 1897 it was to live in Hindhead, Surrey. He then spent the last 23 years of his life in Crowborough, Sussex. The exhibition has secured the loan of an oil painting of Conan Doyle by Sidney Paget which has never been on public display before in Britain. It depicts a man at the height of his powers, notebook in hand which he used in real life to jot down ideas as they came to him. 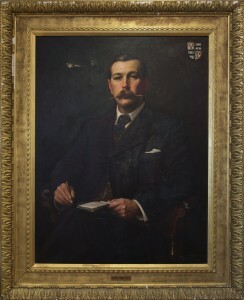 Dating from 1897, the portrait was taken to Switzerland by Conan Doyle’s son Adrian and is currently undergoing conservation. The exhibition will also include original pages from Edgar Allen Poe’s manuscript of The Murders in the Rue Morgue (loaned by the Free Library of Philadelphia)which featured the amateur sleuth C. Auguste Dupin who solved the grisly crimes. 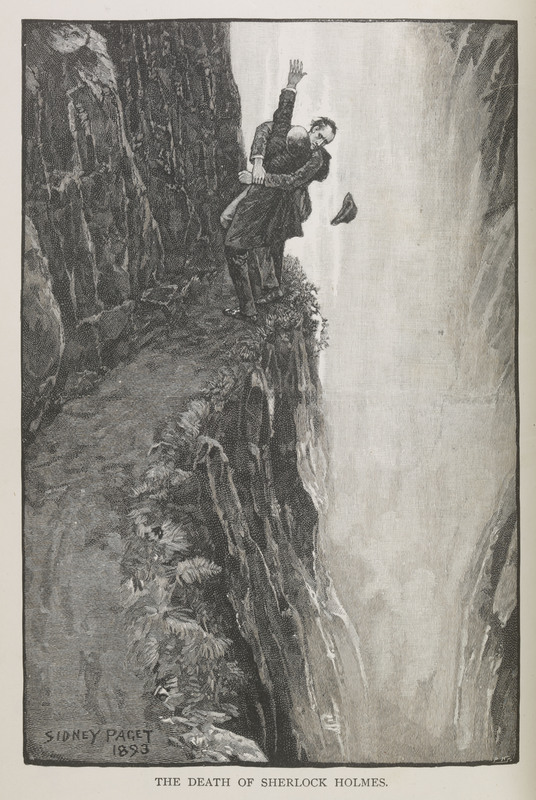 “Its theme,” wrote Poe to a friend, “was the exercise of ingenuity in detecting a murderer” and Conan Doyle is known to have been an admirer of the three stories in which Dupin appeared. 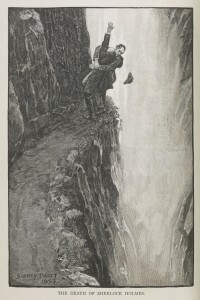 The Free Library has also loaned Conan Doyle’s own original manuscript of The Adventure of the Empty House (1903) which marked the return of Holmes after his apparent death at the Reichenbach Falls ten years earlier. 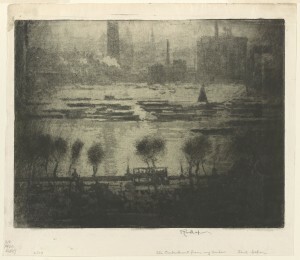 These gave rise to such works as the American Joseph Pennell’s Dark Day on Embankment (1909) with its image of a fog-shrouded London which became the default Hollywood view of the capital, especially in the films featuring Basil Rathbone as Holmes. 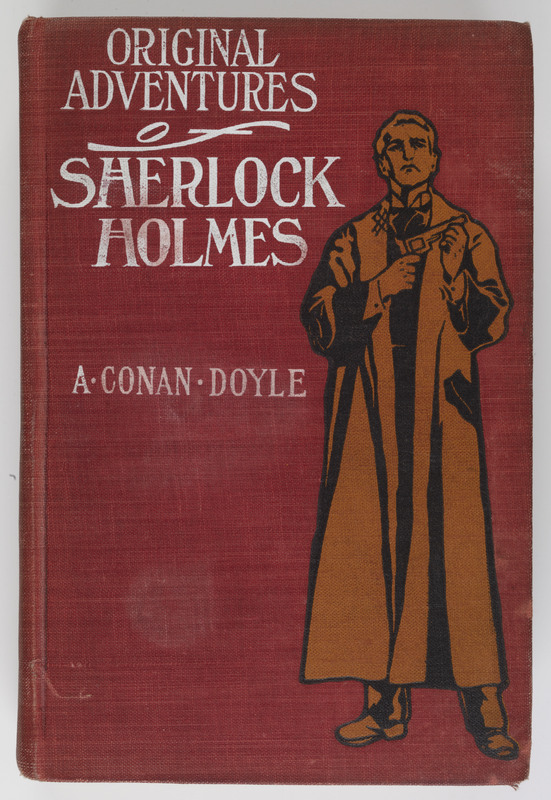 “Conan Doyle depicts London as the centre of a vast empire where calm ultimately prevailed,” explained Dr Hardy. 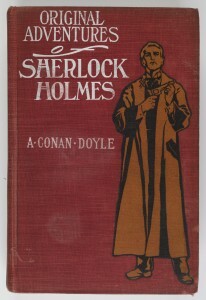 “Perpetrators, often foreign, come to the city only to be out-thought and sometimes outfought by Holmes, who always succeeds in imposing rational order on otherwise chaotic events.” And if the conclusions often gave contemporary readers a sense of quiet satisfaction and reinforced their belief in Victorian supremacy against all comers, today there is still something inspiring about Holmesian deductive logic and its reassuring sense of infallibility in less certain times. Spitalfields tends to be known nowadays for its hyper-trendy shopping and dining area surrounding the old market place. Yet close by stands a building which has withstood the depredations of time and which is now seen as an English architectural masterpiece, deserving of attention in its own right. This church is one of six in the capital designed by Wren’s pupil Nicholas Hawksmoor and is judged to be his masterpiece. A fine example of the English Baroque style, it was constructed between 1714 and 1729 as one of 50 planned “Commissioner” churches for Anglican worship (only 12 were finally built) which were established by an act of Parliament in 1711. There were fears that too many non-conformists were beginning to take over the established church, especially in areas such as Spitalfields where Protestant Huguenots, fleeing Catholic persecution in their native France, had settled and resumed their profession of weavers. Although the Huguenots had their own, much plainer chapels in the surrounding area, they were nonetheless involved in the commissioning, building and activities of Christ Church. A Huguenot, Peter Prelleur, was the church’s first organist and many of his co-religionists were buried in the crypt. However, by 1960 Christ Church was virtually derelict and on the point of being condemned. 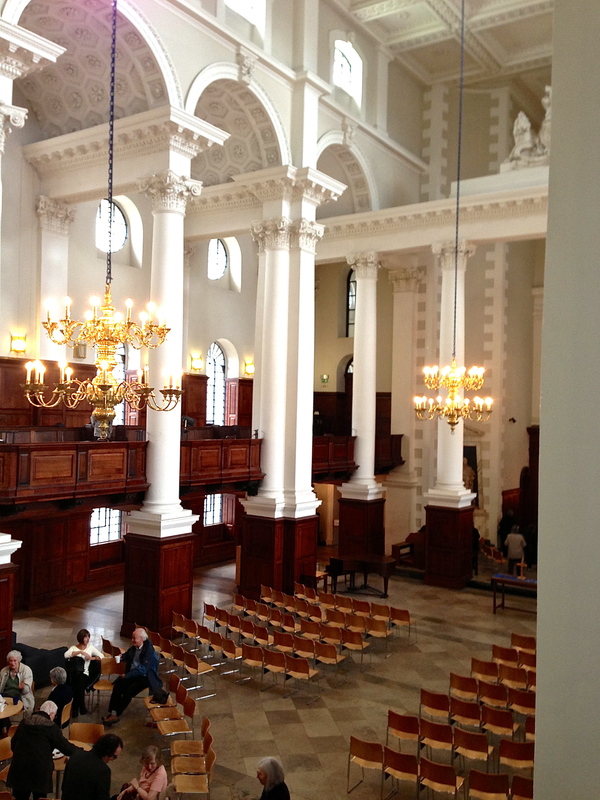 Ironically, the congregation then had to use the Church Hall, a former Huguenot chapel, for their services. But the church was saved thanks to a major campaign and today thrives as a place of worship and centre of activities with a wide-ranging programme of events. Nevertheless, it is always in need of funds – its magnificent organ is currently the subject of a major restoration – and you can help by taking a special tour with the Rector, Andy Rider, an expert on the building and its history on November 12th. Tickets are £20 and advance booking is necessary. 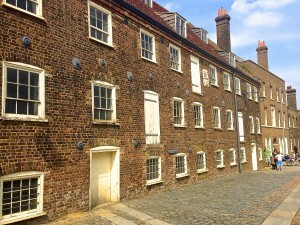 Go to http://www.huguenotsofspitalfields.org/ to reserve a place on the tour and see how you can assist in maintaining this ‘jewel in the crown of London’ at http://www.christchurchspitalfields.org/ . The London Design Festival began in 2003 and is now holding its eleventh celebration of innovative design, including furniture, fashion, stationery and even cutting-edge tea trays. Its aim is to promote London as the design capital of the world and this year there are more than 300 different events and exhibitions. 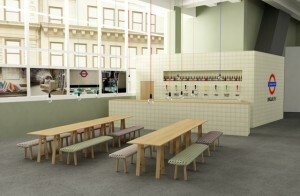 I visited just one of them, designjunction at the former Royal Mail sorting office on New Oxford Street. If you look up you can still see the old area sorting signs but there’s nothing quaint about the designs and products on show. 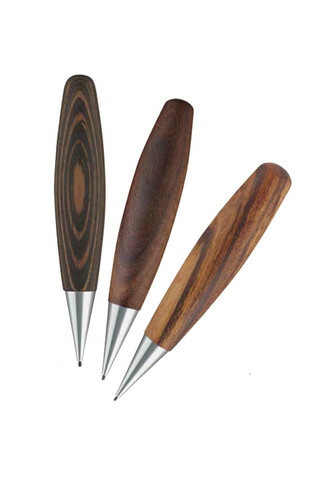 I found myself strangely drawn to the stationery stands and special mention here goes to Israeli firm Pulp for stylish and practical desk-top tools (that’s literally pens, paper and pencils) and Italian Azzura Visaggio’s eye-catching notebooks from her company Wino. The key point is that even if the firm is foreign-based, they are here to try and get into the London and UK market as it is so important internationally. And while you’re there pay a visit to a pub designed to look like an underground station with distinctive tube tiling setting off the beer pumps very nicely. The company behind the ceramics is Fired Earth and if you have a hankering to decorate your front room as if it were an art deco Piccadilly line station c. 1910 then these are the people to go to. TFL are the prime movers behind the project as you’d expect in conjunction with designer Michael Sodeau. Also involved were Kirkby Design, the Nud Collection and Camden Town Brewery, who respectively provided the moquette-covered benches, lighting and all-important alcohol. Takes me back to Sloane Square and Liverpool Street tube stations which actually had platform bars. And as my love of London’s transport system knows no bounds, a visit to the Clippings pop-up shop on the ground floor is a must. For some time now, Transport for London has commissioned designers in conjunction with the London Design Festival to create new styles of Oyster travel wallets. This year being the150th anniversary of the London Underground there are ten different styles from which to choose. They are selling for £6.99 each from the Clippings shop at designjunction until it closes on Sunday 22 September and can also be bought online from the London Transport Museum shop. So not much time left to visit but it will be worth it. Book through Eventbrite, £5 in advance, £10 on the door. 1973 saw the end of a tradition in the City of London which had taken place nightly since the anti-Catholic Gordon Riots of 1780, when the Bank of England had been attacked by a mob. Soldiers were then ordered to guard the building, an event which endured for almost two centuries, only coming to an end forty years ago this year. 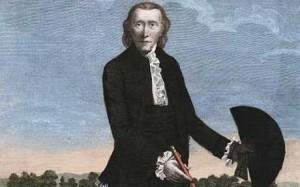 The riots were whipped up by Lord George Gordon, president of the Protestant Association, in reaction to what was seen to be an easing of restrictions on Catholics in England by the Papists Act of 1778. The limitations on Catholics in public life had been enshrined in the Popery Act of 1698 but had all but ceased to be enforced by the time of the new act, making many, including Catholics, question why the new act was even necessary. Despite this Gordon, an unstable man but a fiery speaker, used his oratorical skills and organised a petition which incited anti-Catholic mobs to cause havoc in the capital over a number of days in June 1780. 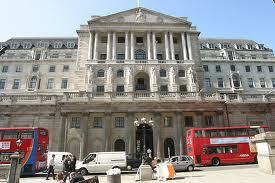 One of their targets was the Bank of England which sustained serious damage in the attack. The army was eventually called out and a shoot-on-sight policy resulted in the deaths of around 285 rioters with up to 30 more being arrested, tried and executed for their part in the rioting. 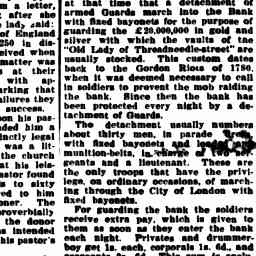 The Lord Mayor had failed to read the Riot Act which would have brought the soldiers on to the streets earlier and was fined the then-enormous sum of £1,000. 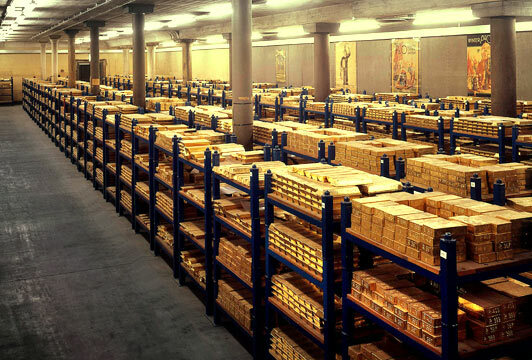 But it was recognised that the bank came very close to being overrun and that its gold reserves could again come under threat. 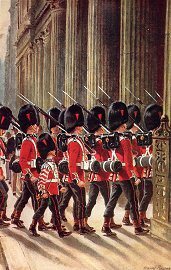 Bow Street Runners were all well and good but it was decided to keep a permanent guard of soldiers overnight, every night, to guard the premises. This military detachment was known as the Bank Guard or Picquet (pronounced picket) and they marched through London from either Chelsea or Wellington barracks, although they were not above catching the Tube, apparently, if it was raining. High-tech security meant the Bank Guard became obsolete in 1973 but its passing was regretted by many, not least the soldiers themselves and it is not surprising when you read how they, and especially their officers, were treated when on duty. I came across an article in an Australian newspaper from early last century which gives an insight into the already antiquated tradition of the bank Picquet. Reading this it is a source of much regret that I never took time to witness the nightly march of the guards into the bank, although seeing them march out again at six or seven the next morning night have provided more entertainment. This year marks the bicentenary of the birth of John Snow, Yorkshireman, physician and the father of epidemiology, the study of the patterns and causes of health and disease in populations. 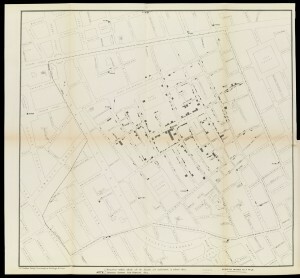 To mark the event, the London School of Hygiene and Tropical Medicine (LSHTM) has opened its doors to the public with a free exhibition – Cartographies of Life and Death: John Snow and Disease Mapping – about Snow’s pioneering work by which he discovered the true cause of cholera and employed methods of analysis and cartography which are still used today in many different fields. The oldest of nine children and from the proverbial deprived background – his father was a coal haulier in the local yards in York – he was brought up in one of the poorest districts of the city, constantly at risk of flooding from the nearby River Ouse. A bright boy, he was apprenticed to a surgeon aged 14 in Newcastle upon Tyne where he first encountered cholera in 1831 when there was a major outbreak in the city. He came to London in 1836 to study for his medical degree, qualifying in 1844 and in 1850 was a founding member of the Epidemiological Society of London, formed after the 1849 cholera outbreak in the capital. 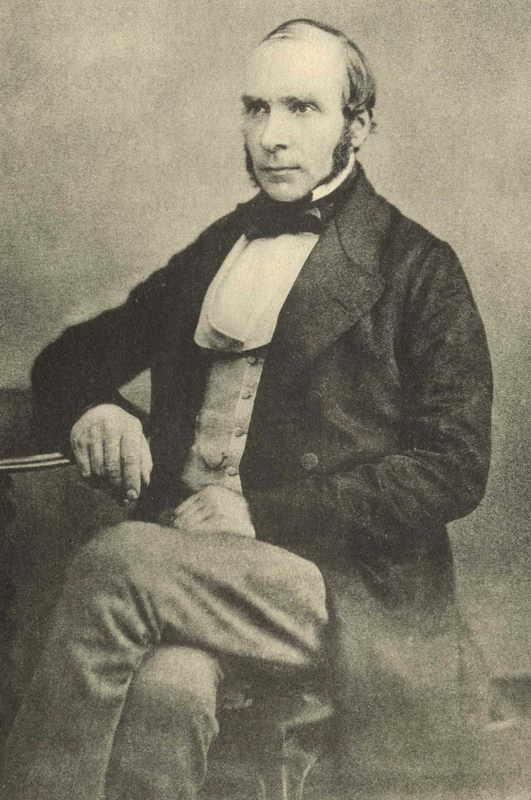 Snow was interested in the physiology of respiration and, when a dentist friend of his asked him to observe his use of anaesthesia on his patients – the first time this had been done in Britain – Snow was intrigued and within a month had published tables on the vapour pressure of ether which led to his developing instruments for the accurate delivery of anaesthetics as opposed to the handkerchief over the mouth technique which had prevailed up to this point. He became the most prominent authority on anaesthesia in the country. 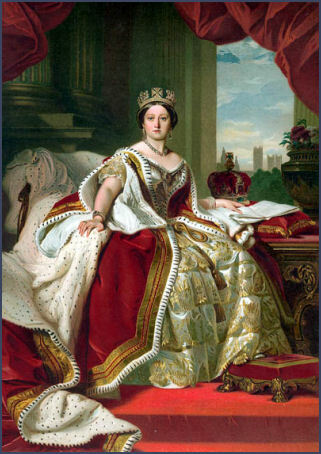 In fact, he became what would now be seen as a celebrity physician, administering chloroform to Queen Victoria when she gave birth to her last two children, a task she regarded as the downside of marital bliss. Her acceptance of the latest medical advance belies her image as a traditionalist and helped promote Snow’s methods and renown. When cholera struck again in 1848, this time in London, Snow’s earlier experience of the disease led him to question the prevailing orthodoxy of the time as to its cause. Most physicians believed it occurred due to an atmospheric “effluence” or “miasma” which was inhaled and spread through the lungs, whereas Snow’s first-hand experience of the illness in Newcastle 17 years before and his own respiratory studies had convinced him that the cause lay elsewhere. 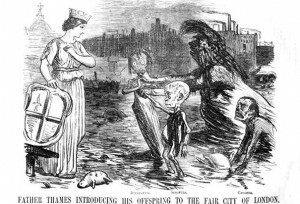 “He had argued that cholera had nothing to do with the lungs or a miasma in the air,” says Professor Paul Fine, Professor of Communicable Disease Epidemiology at the school. “William Farr, who compiled mortality statistics for the General Register Office and followed the miasmic route, believed cholera was a result of elevation, the higher up you were the purer the air. 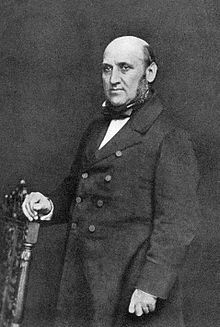 But Snow said that cholera infected the intestines and not the lungs and was certain the cause lay elsewhere, most likely through ingestion not respiration.” Cholera struck again in London in 1853 and, to prove his atmospheric theory, Farr gathered statistical evidence on the epidemic. You can prove many things with statistics and Farr was able to demonstrate his theory that the greater the elevation at which people lived above the River Thames, the less chance they had of catching cholera, so confirming his pure air/miasmic view. 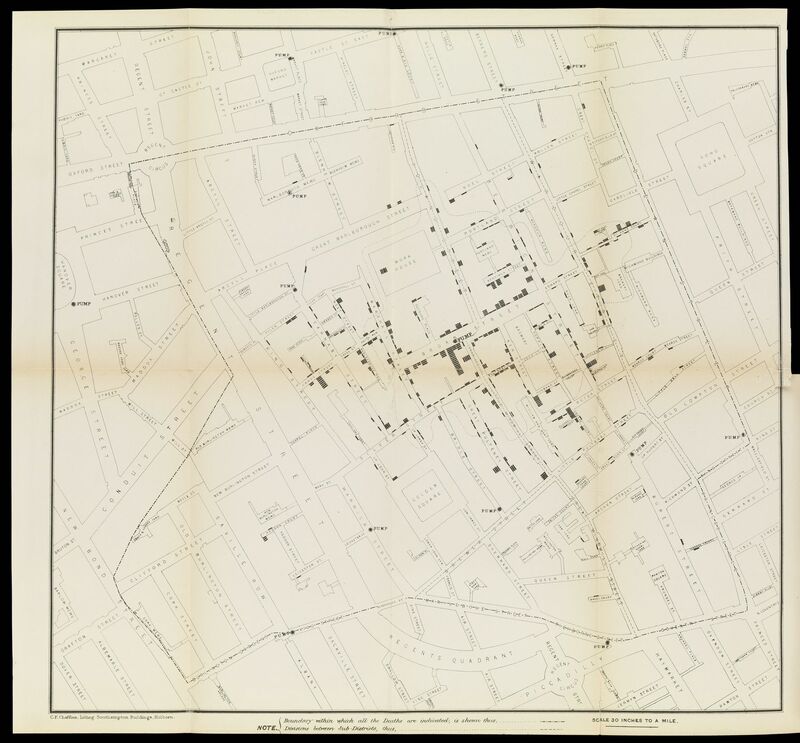 Snow only ever produced two maps in his life – his study of the two London water companies revealing their sources of supply and a map showing the deaths from the Broad Street outbreak – but they were to prove immensely influential as building blocks of epidemiology. His methodology has been adopted in other fields of study such as education and criminology and a poll of British doctors in 2003 ranked him as the greatest physician of all time. Snow himself would only drink boiled water and even became vegetarian and teetotal for a decade until his health deteriorated and he returned to meat and wine. He died of a stroke in 1858 but not before he had seen Farr and others accept his theories and methodology. The exhibition includes many historical documents and ephemera and works by contemporary artists on related themes and there is even a pop-up water bar in Broadwick Street itself. 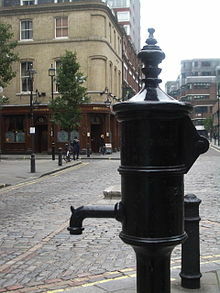 Visitors will also be able to use a mobile website which integrates contemporary aspects of mapping such as GPS and Google Maps to travel from the main exhibition site on Keppel Street through Victorian London to Broadwick Street, which has a pub named after John Snow and a replica water pump in his memory- with no handle. London’s latest tourist attraction is 800 feet above ground and it takes two lifts to get there – but The View from The Shard is likely to become one of the capital’s major visitor experiences, despite the relatively high entrance price. Designed by the famous Italian architect Rienzo Piano, the building makes full use of an irregularly-shaped site by climbing more than half a mile into the sky to become what its designer calls a ‘vertical town’. 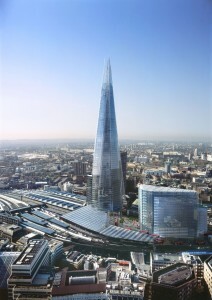 At 1016 feet (310m), The Shard is the highest building in Western Europe and contains 95 floors. Of these, 78 are habitable consisting of shops, a five-star hotel, office space, ten luxury apartments, restaurants, a swimming pool and The View from the Shard itself, the first of these areas to be open to the public. It is claimed that the view from The View is the only place from where it is possible to see all of London at once as it offers a complete 360-degree panorama of the metropolis. On a clear day that may well be true. Unfortunately, my preview took place beneath overcast skies and the normal range of 40 miles (64km) across the city and beyond was more limited. However, what it did offer was a wonderful snowy carpet as far as the eye could see, a unique experience in itself. Visitors enter the building in the appropriately named Joiner Street by London Bridge station. This is also your one and only chance to use the toilets as you won’t find any once you ascend. While security checks are made, you can pass the time being amused by a gallery of 140 famous ‘Londoners’ including Boris Johnson shining Ken Livingstone’s shoes, Kate Moss marrying Henry VIII and the Duke and Duchess of Cambridge depicted as a Pearly King and Queen. 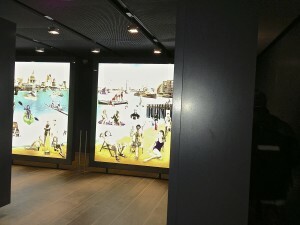 Video screens illustrate the growth of the capital over the centuries and explore the history of the London Bridge area itself. 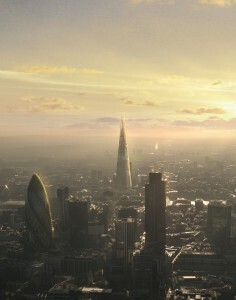 Short films show famous London sights and streets, many of which are visible once the visitor looks down from The View. Then it’s elevator time, two to be exact, the first taking the visitor to level 33 at the rate of six metres per second, a thirty-second journey in all. The lifts are what the attraction calls ‘kaleidoscopic’ – that is, they have built-in video screens and mirrors which aim to give the impression of soaring upwards through the London skyline. Famous sights include the dome of St Paul’s, the Monument’s spiral staircase and the glass roof of the British Museum’s Great Court. Ticket-holders then transfer to another lift through a map of London made from graffiti and questions designed to tease out your knowledge of the capital. They are guided by a winding image of the River Thames below their feet with wall projections describing different parts of the city. Half a minute more and the second lift has transported the visitor to level 68 and the ‘cloudscape’ which gives examples of the type of clouds you might be seeing up above and what you could expect from them in terms of weather conditions. Cumulo-nimbus, anyone? 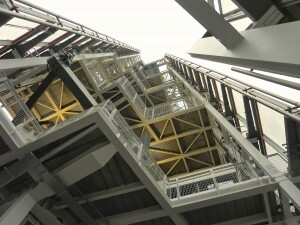 From there it’s a short flight of steps up to the next level and the main viewing gallery. It’s a triple-height, glass-encased airy space which offers a total view of London. Clocking the Tower, St Paul’s and the Houses of Parliament wasn’t difficult. 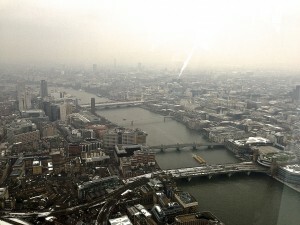 Trying to locate the Olympic Stadium and the Thames Barrier was more of a problem due to the misty weather conditions. I was even hoping for a glimpse of my home near Ally Pally to the north, but no luck. Ironically, directly in the shadow of The Shard is Southwark Cathedral, itself once London’s tallest building – in the 17th century! A spokesperson for The View told me that “if visitors come to the attraction and visibility is poor they will be offered the chance to come back on another day. Also tickets are transferable so if they can’t come somebody else can use them. “In terms of monitoring visibility, it is difficult because the weather can be so temperamental. It’s done on a case-by-case basis; there’s no set visibility limit by which the offer to return kicks in. “But we do offer people the opportunity, if they still want to go up, to use the Tell:scopes which display pre-recorded day, night and sunset views. And fortunately there are very few days a year when visibility is so poor that we would be forced to make the offer.” Clear day or not, The View has twelve Tell:scopes, state-of-the-art digital telescopes being used in Europe for the first time. 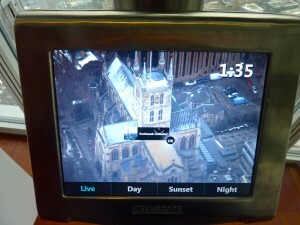 Visitors can view the scene in real time on a screen while the scopes zoom in on what they are seeing and describe the landmark. If the view is obscured, pre-recorded commentaries are available detailing more than 200 landmarks in ten different languages. But the time on each scope is limited and you may find yourself having to move to another in order to give someone else a chance. 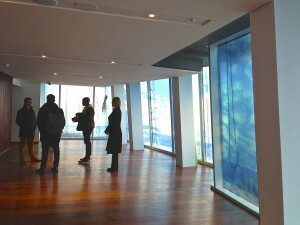 Visitors can then climb even further, to the viewing gallery on level 72, the highest floor of the skyscraper open to the general public. This area is partially exposed to the elements and on my preview day there was no shortage of them as the temperature barely climbed above freezing and light snow began to fall. But the arctic conditions were offset by the spectacular sight of the giant shards of glass forming the building’s pinnacle rising towards one another while not actually touching, allowing the edifice to ‘breath in’ the atmosphere through its summit. As the attraction offers free Wi-Fi, guests are encouraged to share pictures, texts and video on social networks as they look across the capital stretching out before them. And it must be said, speaking both as a fan of very tall buildings and a Londoner, the sight enthralled me. The descent lifts also provide a multi-media experience: the sky recedes, seasons change and busy London streets suddenly appear. However, while the views are breathtaking, so are the prices. This high doesn’t come cheap. An adult will pay £24.95 and a child £18.95. There are no family tickets to lessen the blow but entrance is strictly timed and there is no queuing. However, if you and your mates haven’t taken the time to book online or by phone in advance and are suddenly grabbed by the urge to ascend The Shard, it will set you back a whopping £100 each. “If we’ve got the room and if you’ve got more money than sense – or time- you can turn up at the box office and go up immediately,” says The View’s chief executive, Andy Nyberg. “But that’s just a pressure valve for people who want immediate access.” Nyberg is the go-to guy when you’re opening a very tall building like The Shard and he has previous. He did the same job at the Willis (formerly Sears) Tower in Chicago, America’s tallest building, and at the Burj Khalifa in Dubai, the world’s tallest building. “We are offering a queue-free experience,” says Nyberg. “If you go to similar places and pay for a queue-free ticket, it’s about the same price.” But there are no similar places in town and that’s The View’s USP, as Nyberg knows. “This is the only place in London where you can get a 36-degree view of the city. All the other buildings are private. Here, anyone can come and look down at the river winding along and the train tracks spreading out from the base of the building like a spider’s web.” This is true and having been to the top of the Burj in Dubai, the Empire State Building and the excellent Top of the Rock in New York, The View from The Shard has one other great advantage – its historical outlook. “The historical perceptive is unmatched,” says Nyberg. “In The Shard we have a 21st-century tower across the river from the 11th-century Tower of London.” But he could have gone on and pointed out every major historical and unique London landmark: Buckingham Palace, Westminster Abbey, Lambeth Palace, the Thames Barrier, Wembley Stadium, Battersea Power Station; literally hundreds of them. You cannot compare this to a forest of skyscrapers stretching to dry desert in Dubai, for example, and it could be argued that the Eiffel Tower offers less famous landmarks, although its viewing gallery is higher than The View’s. Nyberg is aiming to draw in a million visitors a year and is suggesting people book ten days in advance so as not to be disappointed. A quick check on the website indicated that weekends, as you’d expect, are busy, but weekdays are relatively free and, as the attraction is open from nine in the morning until ten at night, that might be a better bet. But if you’re thinking of transporting your loved one to the giddy heights on Valentine’s Day, act fast as many others have got the same idea. 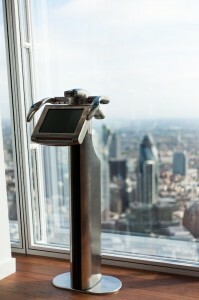 Ultimately, The View from The Shard has the same chance of succeeding as had the London Eye. Many doubted the Eye’s long-term viability but it has become an iconic part of the London skyline and the most popular paid tourist attraction in the UK, and all this in less than thirteen years. 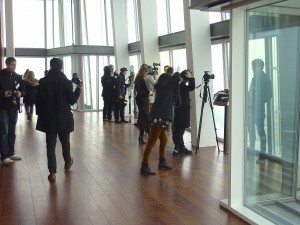 If The View from The Shard can generate enough buzz on social media and through word-of-mouth, helped also perhaps by a hefty marketing budget, there is no reason why, with the building’s other attractions, it too cannot be successful and become yet another unmissable London attraction.